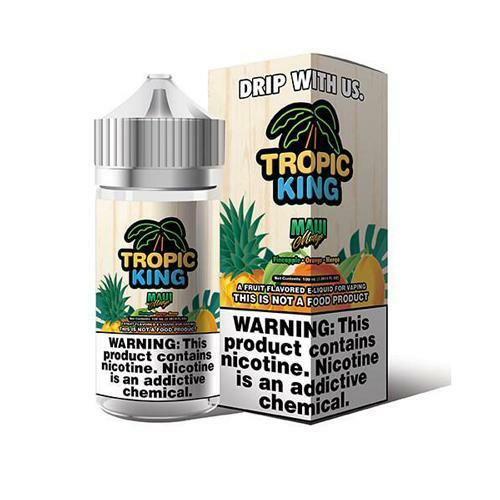 Tropic King Maui Mango E-liquid is a delicious and exotic blend of juicy mango, sweet Hawaiian pineapple and zesty oranges for a vaping experience that is nothing short of paradise. This delectable tropical fruit vape has deep rich flavor and aromatic vapor clouds that will take you to an island getaway every time you inhale. This delicious new e juice is destined to be your new all day vape. Tropic King E-Juice is manufactured by Dripmore (Candy King, Cookie King, Milk King) so you know it’s good! Grab a 100ml bottle of Maui Mango today and see why it is one of the top new e juices to hit the vape scene.